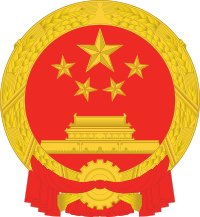 The state emblem of the People's Republic of China is typical of socialist and communist heraldry. The colour red and the star are symbols of communism; grains are often used to represent agriculture, farmers, or the common people, the cogwheel or other industrial tools represent the industrial proletariat. Socialist heraldry, also called communist heraldry, consists of emblems in a style typically adopted by communist states and filled with communist symbolism. Although commonly called coats of arms, most such devices are not actually coats of arms in the traditional heraldic sense and should therefore, in a strict sense, not be called arms at all. Many communist governments purposely diverged from the traditional forms of European heraldry in order to distance themselves from the monarchies that they usually replaced, with actual coats of arms being seen as symbols of the monarchs. The Soviet Union was the first state to use socialist heraldry, beginning at its creation in 1922. The style became more widespread after World War II, when many other communist states were established. Even a few non-socialist (or communist) states have adopted the style, for various reasons—usually because communists had helped them to gain independence—but also when no apparent connection to a Communist nation exists, such as the emblem of Italy. After the fall of the Soviet Union and the other communist states in Eastern Europe in 1989–1991, this style of heraldry was often abandoned for the old heraldic practices, with many (but not all) of the new governments reinstating the traditional heraldry that was previously cast aside. Soviet leaders sought to distinguish their insignia from the emblems used by the Russian Emperor and aristocracy. They replaced and omitted the traditional heraldic devices, substituting an emblem that did not conform to traditional European practices. The Soviet Union, created after the 1917 revolution, required insignia to represent itself in line with other sovereign states, such as emblems, flags and seals, but the Soviet leaders did not wish to continue the old heraldic practices which they saw as associated with the societal system the revolution sought to replace. In response to the needs and wishes, the national emblem adopted would lack the traditional heraldic elements of a shield, helm, crest and mantling, and instead be presented more plainly. This style was followed then by other socialist and communist states, which wished to also focus attention on the nation's workers and diverge from feudalism and all of its associations. In some communist countries, the socialist heraldry was never adopted fully. The coat of arms of Poland was only changed slightly under the communist era, retaining the traditional heraldic form. In Hungary, the "Rákosi badge", an emblem in the form of socialist heraldry, was adopted following the Second World War, but after the 1956 uprising, a new emblem was created combining communist symbolism with a heraldic shield in the colours of the Hungarian flag. Czechoslovakia became a Communist country in 1948 but retained its original coat of arms until 1961, when they were replaced with a non-traditional shield depicting the heraldic Bohemian lion without a crown and with a red star above head. Some of the states of Yugoslavia also used heraldic shields coupled with socialist imagery in their emblems, as did two republics within the USSR: the Russian Soviet Federative Socialist Republic and the Ukrainian Soviet Socialist Republic. Hammer and sickle, representing respectively the workers and peasantry. More rarely, a hammer may be used on its own, to represent the working class(es) as a whole. With the dissolution of the Eastern Bloc in Europe, most of these countries' socialist heraldry has been replaced with old pre-communist symbols or by wholly new coats of arms. Socialist heraldry is still seen in the emblems of several countries, such as the People's Republic of China. North Korea has a national emblem in pure socialist style, as does Vietnam. During the infancy years of the Russian Federation (the successor to the Soviet Union), the country used the modified version of the emblem of the RSFSR with the inscription was changed from RSFSR (РСФСР) to the Russian Federation (Российская Федерация/Rossiyskaya Federaciya) until the new coat of arms was adopted in 1993. The national emblem of Belarus was adopted in 1995 following a controversial referendum. It is reminiscent of that of the Byelorussian SSR and replaced the coat of arms of 1991-1995 which followed the traditional heraldic style. Tajikistan and Uzbekistan retained components of their respective republics for similar reasons. The national emblem of North Macedonia is reminiscent of that of the Socialist Republic of Macedonia (once a constituent socialist republic of the Socialist Federal Republic of Yugoslavia). In Africa, the emblems of Angola and Mozambique, as well as Guinea-Bissau, use socialist heraldry. The Republic of Serbia used the coat of arms of the Socialist Republic of Serbia until the recommended symbols by the National Assembly on August 17, 2004. The recommended usage was made Law on May 11, 2009 thus officially replacing the socialist heraldic Coat of arms. The unrrecognised state of Transnistria has a state emblem based on a Soviet-era design, despite not being a socialist state. Below are galleries of historical and current national emblems. The years given are for the emblems, not for the countries. This is not an exhaustive gallery, since they are here to illustrate the article, not to show every example. Only long-lasting emblems of independent countries are shown. They also exclude emblems which were a mix of traditional heraldry and socialist symbolism, like the present arms of São Tomé e Príncipe and of East Timor, the 1960-1990 Emblem of Czechoslovakia, or the 1974-2008 state seal of Burma, or traditional heraldic coats of arms of socialist countries, like those of Guyana, Portugal and Cuba. ^ a b von Volborth, Carl-Alexander (1981). Heraldry – Customs, Rules and Styles. Ware, Hertfordshire: Omega Books Ltd. p. 11. ISBN 0-907853-47-1. ^ a b von Volborth, Carl-Alexander (1972). Alverdens heraldik i farver (in Danish). Editor and translator from English to Danish: Sven Tito Achen. Copenhagen: Politikens Forlag. p. 158. ISBN 87 567 1685 0. ^ "Zakon o izgledu i upotrebi grba, zastave i himne Republike Srbije" [Law on the Appearance and Use of the Coat of arms, the Flag and the Anthem of the Republic of Serbia]. Official Gazette of the Republic of Serbia – No. 36/2009 (in Serbian). Narodna skupština Republike Srbije – JP "Službeni glasnik" (published 2009-05-11). 2009-05-19. Archived from the original on 2009-08-02. Retrieved 2009-12-15. ^ a b Constituent republic of the Soviet Union, but was a separate member of the United Nations. ^ P.J. Symes, "The First Banknotes of the Central Bank of Iraq"
Slater, Stephen (2002). The complete book of Heraldry. London. Gorman, John (1985). Images of Labour: Selected Memorabilia from the National Museum of Labour History. London: Scorpion Publications. Gorman, John (1986). Banner bright: An Illustrated History of Trade Union Banners. Buckhurst Hill, Essex: Scorpion Publications.